RAILROAD.NET • View topic - What VIA Rail trains have you ever taken? 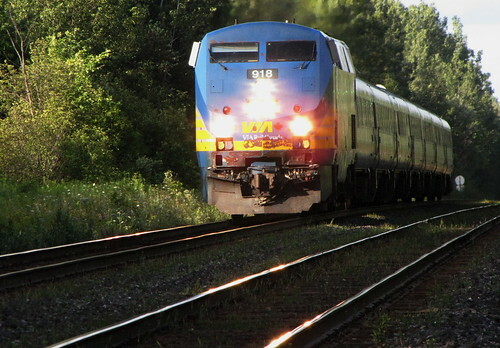 What VIA Rail trains have you ever taken? The Canadian? The Chaleur? The Ocean? The Corridor? Any other? What VIA Rail train have you ever go in, no matter how long/short your trip was. As for myself, I've only taken 2 different trains, the Northen Quebec and the Ocean, to be more Specific, I went form Shawinigan to Weymont (great scenery after La Tuque, BTW) and From harny to Moncton (The scenery was great too) Both on comfort class. The Northen Quebec one... I took taht one at least 15 times, mostly from/to Shawinigan to Weymon, although I went a few times to Casey as well. MANY (if not all) people who get on in Shawinigan get off either at La Tuque, or Weymont since all these three city are popular among aboriginal people (Well, Weymont IS an aboriginal village. Crew is very friendly, and I noticed that they seem to know quite a few people in the train (most probaly regulars) I almost always end up in a conversation with someone I do not know, and very often, the conversation is fun and interresting. Re: What VIA Rail trains have you ever taken? My first encounter with VIA (actually VIA-CN as it was known then) was in July 1976. I was riding on #18 from Stellarton to Antigonish and the through Day-Niter from Montreal to Sydney appeared in the new paint scheme. Since then, I’ve been on just about everything VIA has operated with the major exceptions being: Jasper-Prince Rupert and Winnipeg-Churchill and a lot of those runs are no longer with us…… having been lost in the big service cuts of November 1981 and January 1990. Also a real favorite……the Atlantic……gone since 1994. But I find the system VIA now operates is good…..very good. Maintenance is top-notch and the crews……consistently excellent. Unfortunately, my first major encounter with VIA was in the 21st century - first aboard the Ocean, then the Canadian, former Enterprise (which was a great overnight train), Jasper to Prince Rupert train, various "corridor services" and then finally the Montreal-Gaspe train. All of the overnight trains are superior and my favorites. However, a unique experience - the Jasper to Prince Rupert train (the Skeena) is just packed with scenery running through the heart of the northern Canadian Rockies. The highlight of this train was when the Panorama car operated on this train (as part of VIA's Totem/Totem Deluxe class). Unfortunately, these Panorama cars seem that they will be shifted this year to the Canadian running from Edmonton to Vancouver. A disappointing shift of equipment for the Jasper to Prince Rupert train. I'd like to take the Hudson Bay train from Winnipeg to Churchill, but I have to find a connection between the Canadian and all that would work out best - plus wait hopefully for an overhaul of rail that I heard is needed on this line. The northern Quebec routes I have also not been on largely because I am not sure if I could endure comfort class for the entire "day trip." For example if they had a specialty car - Skyline Dome or Park Car - operate on one or both of these trains on certain times of the year, I would gladly book a trip - or even a private car type trip. Is this perhaps a route for the Glen Frasier car - travelling on the more longer and scenic portion of these trains etc. But VIA is a first class operation on routes it offers a "Tourist" or "Businss Class" operation - the new terms I am slowly getting used to. I really liked the more unique "Totem," "Easterly," and "VIA 1" service. It can not compare to Amtrak unfortunately. The Canadian(once) and The Malahat(many times). Don’t miss the opportunity of riding the trains to northern Quebec for lack of first class service. Sleeper travel is OK but the work-horse, coach-only day trains provide some of the best experiences. I did the trip to Jonquiere last year and it was one of my most enjoyable VIA rides in a long time. The jack-of-all-trades Service Manage/Car Attendant seamed to know everyone and provided just as good service as I’ve had in VIA-1…….bringing coffee right to your seat or serving snacks and sandwiches which were just fine. And the seating was in a HEP1 long distance coach……same as you would find on the Canadian. Here’s a link to my Trip-Report (sorry……the photos in the report are on a different server now and I can’t seam to edit to add them again) Moderator's note:the photo links have been updated thanks to the new location information provided by the author. I've taken quite a few corridor trains over the years, always in comfort class (I'm sure VIA 1 is nice, but I've never been able to justify it). I've also been a frequent traveller on The Ocean over the last several years, taking that train 2 or 3 times a year between Truro NS and Montreal, and then corridor connections on to Brockville, ON. I love that trip, and I've never had a disappointing experience. I've travelled comfort class in both Renaissance and Budd consists, with my only sleeper experience so far being my last trip where my girlfriend and I were able to upgrade to get upper and lower berths in the Budd consist (thanks to a discount from our last trip where we were over 2 hours late). That was a very nice experience, and I wish I could travel Sleeper class more, it's just too much of an expense for frequent travelling. The scenery is fantastic on The Ocean, and both comfort class and sleeper are very comfortable ways to travel. I don't like the Renaissance cars quite as much, although I do very much like the single seat option sometimes when I'm travelling alone. They may be better for short, high speed trips, but long trips in the Ren cars are hard to do. The LRCs can't be beat in the corridor, although the HEP-2 cars are quite decent as well. In terms of service, I've had mixed experiences. Some staff have been very pleasant, but some have been down-right rude! The Ocean seems to have a mixed bag of a crew. Some of them are very friendly, and will chat with you and help with anything you need. Some though are dismissive, unhelpful, and often rude. One of the gentlemen in the diner last time was clearly in a bad mood, and made it known, while most of the staff there are very pleasant and courteous. The worst experience I've had yet was almost getting left off the train in Cambellton, NB! I had got off the train to stretch my legs and watch the crew refuel the locomotives, at what is a designated smoking break. As I got off, I checked with one of the female crew members who assured me I had 15 minutes. I said ok, I'd just go walk around. I never went more than 10 feet from the train, I just walked up from the second coach to the locomotives, and strolled around. A few minutes later (maybe 10), I saw people had got back on the train, even though they had just started fuelling the second loco. I thought I should head back, so I did. Just as I got to my coach, I saw that same woman I had just informed I was getting off, closing up the doors! She had closed the lower door, and was shutting the window part as I called out "hey! ", and she opened it back up for me with some comment about "you really should pay attention...blah blah blah....". I don't know exactly what I would have done if I hadn't come back right then and caught her as she was closing the door. It just irks me because I never went that far away, so she could clearly see me from where she was. And, I had specifically talked to her as I got off, which I thought would have reminded her that I was from the train, and hadn't gotten off to leave there. Overall though, my experiences have been positive. I did notice though, that the treatment does seem to improve when you upgrade classes. We were treated much more respectfully and with much more care when we were travelling in the sleepers than we had ever been in the coaches. I suppose you get what you paid for, but I would still expect to be treated the same. In addition to The Ocean, I would also love to take The Canadian (of course), and every other train VIA runs at some point, but it will be a while before that happens! It's too bad the LRC cars (running on the corridor with the Renaissance coach cars) couldn't be traded for the Renaissance coach class cars on the Ocean, since they seem to be more comfortable overall - for an overnight journey! I've heard lots of complaints about comfort class (coach) on the overnight Ocean train (how uncomfortable it is etc.). The northern Quebec trains seem to operate in a similiar fashion to the Jasper to Prince Rupert train, minus an observation car. I'll have to see if I can fit this train into one of my upcoming schedules? So the northern Quebec trains offer onboard food service (from a cart I presume)? Do they also feature a fold down or fold out small table per seat as well? I'd likely do some writing while onboard. @NS VIA, do you have a gallery of photos like that? Really cool! As for the original question, I'm sad to say the only Via experience I've had was a 1995 Niles-Toronto International trip, consisting of a Via F40 and horizon coaches, with ex-CP stainless added at Sarnia. I took a quick walk into the closed Via/CP coaches and noticed glass partitions with an HO-scale swiss electric loco on display. Odd but interesting. I'd like to cover all Via routes, but I have the feeling that could take a while and a pile of money. I think the Northern Quebec routes would be priority, along with the Atlantic routes. All directions and time schedules from.... Toronto to Montreal, Toronto to Windsor, Toronto to N.Falls, Toronto to Ottawa, Toronto to Sarnia. Not to leave out the Retired International and the still operational Maple leaf (AMTK/VIA). My next adventure will be the Canadian and/or the Oceans. However time, money, and the fact Im in Florida currently are the recent Obstacles. Location: Chicago, NYC, Toronto, & Orlando(Ocala) at any given time. for $155 CDN and I traveled as far E as Ste-Foy to visit Quebec City and as far W as both Sarnia and Windsor. I definitely got my money's worth on that pass remembering the places I visited and the trains I rode. My best memory on that pass was the very final day in which I traveled from Quebec City to Montreal and then upon finding out that the Montreal hostel was sold out for that night I decided to ride an LRC train to Toronto and then travel back to Montreal on the Cavalier which operated on the overnight from Toronto to Montreal. I remember as I was running around Toronto using the TTC that there was no way I could miss that train E because my money was tight and buying another ticket would have been a setback for me but I got back to Union Station in time for VIA to put me up for the night which worked out fine. There was space available the next morning at the Montreal hostel where I spent the next 10 or so days-another story in itself. I have taken the NYC-Toronto Maple Leaf numerous times-especially back in the 80s and I took 8 rides or 4 round trips using the Budd car train which ran from Buffalo to Toronto in 1979-80. Ah - now there's a train that should be re-established - Toronto to Buffalo. Even if it was an RDC service. Course the border crossing would no doubt delay this train. However, I bet it would still be better than bus travel! Throw in the Lake Shore as a connection and one has an overnight "International" train once again between Toronto and Chicago, just on the water level route. Vancouver island budd rdc , then Ferry up to Prince rupert . Prince rupert to Edmonton , bus to Calargy , train to Banff , biked to Jasper , then train to Winnipeg . Train to churchill and return . train Winnipeg to Montreal , then train to quebec . Ferry across river , then train to halifax . Return to Montreal via the USA route , then train to Toronto . train to niagara Falls then biked across to the USA . sorry i cant remeber many train names , this was all late eighties . I got to find a good way to do the Ocean sometime (extra vacation maybe). Haven't been on VIA much, but when I have, its been top notch service. Ottawa-Montreal, and Montreal-Quebec City last September, with parents and brother. And I'm Anxiously awaiting a trip on the Chaleur with my parents and brother, this coming July.